Achieve your goals with Nuclino as an easy knowledge base to capture meeting notes, plan goals, and more. Great managers inspire and drive their teams towards a goal. An efficient leader needs to be able to communicate the company vision to the team in a clear and transparent way, and collaboratively design a strategy to execute it while taking into account the team's feedback. Traditional approach to management involves countless meetings, email strings, information silos, and one-sided communication – your team deserves better. Whether it's documenting and following-up on meetings, communicating goals and strategies, or creating and sharing visual roadmaps, Nuclino helps your team stay connected, aligned, and collaborative, making it easy for all employees to engage. Capture meeting notes collaboratively and refer back to them later. 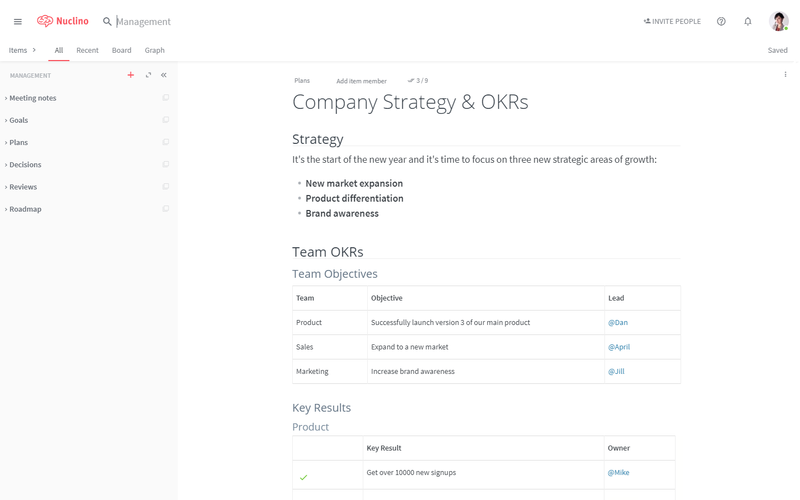 Plan goals, strategies, and more in one place accessible by your whole team. Create product and company roadmaps in an easy and visual way. Collaborate with your team in real-time on any management-related content. Use comments to give and receive feedback on plans and goals. The board view provides an easy and visual way to track roadmaps and more. So @Nuclino looks amazing. Such a smart approach to collaboration. Like the best of @SlackHQ, @medium, and @evernote in one. Moved our internal wiki from confluence to @Nuclino. Lovely product and well worth checking out! Happy to find nuclino.com as a alternative to confluence! Good for small teams and it's free! @Nuclino good job! @Nuclino <3 you. Looking for this for a long time. Found @Nuclino and so happy about it. Handy, simple, free at first. Best thing for ideas-workout inside a team. After a week of searching.